An architect's rendering of the front facade of a redeveloped building at 517 E. Hopkins Ave. that will house a global collaborative workspace company and an associated retail storefront. A downtown developer is skirting the city’s municipal code that requires him to build on-site employee housing in his new building. That’s because the commercial tenant proposed to occupy the space was intriguing enough for the citizen board to approve it. The city’s Historic Preservation Commission in December went against the recommendations of the local housing board and the city’s Community Development Department that Mark Hunt should put apartments on the second floor of his redeveloped building at 517 E. Hopkins Ave. Instead, HPC members agreed — after a two-hour discussion — that Hunt’s prospective tenant, an unidentified global shared workspace company, is enough of a community benefit that it could replace on-site housing. “HPC was interested in affordable workspace and the community benefit in that,” said Amy Simon, the city’s historic preservation officer. So, the nearly 11 full-time employees who will be generated from the new building will be mitigated by Hunt either building affordable housing or using housing credits. The credit program allows a developer to build affordable housing and get a credit for each unit that comes online. That credit can then be sold to another developer who uses it to fulfill employee mitigation requirements on a separate project. Hunt’s project had to go through HPC review because of changes to previously approved plans and the request to remove on-site affordable housing. In her memo to HPC members, Simon was clear on what the community development department’s position is regarding on-site affordable housing. “Staff has reinforced the importance of on-site affordable housing mitigation in several recent projects,” Simon wrote. “No evidence has been provided that replacement of the current on-site housing at 517 E. Hopkins is inappropriate, therefore mitigation should occur on this property. But Hunt and his land-use planner, Chris Bendon, were able to convince HPC members otherwise. “They thought, what’s good for the goose is good for the gander, and what a great opportunity it is,” Bendon said. Hunt had told the Aspen-Pitkin County Housing Authority board a week prior to the Dec. 12 HPC meeting that he was planning to build a complex that would house close to 70 workers, but he didn’t mention the prospective tenant. Bendon said outside of both meetings that Hunt has been courting the company for at least a year. He declined to reveal the name of the collaborative workspace company, saying it’s up to them to announce their arrival. Shared workspaces for entrepreneurs, freelancers, small businesses and startups have gained popularity around the world in recent years. 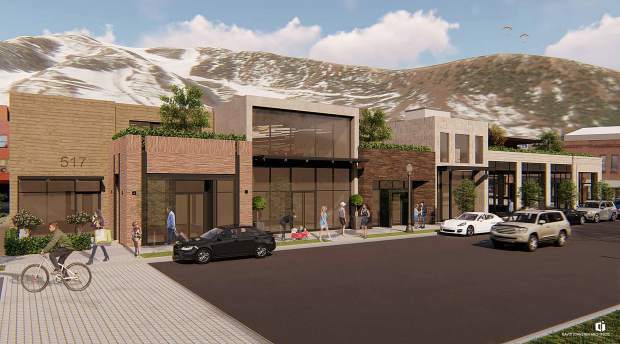 It will fill a void in downtown Aspen where a finite amount of office space exists and rents are high, Bendon said. “There is a massive barrier with the costs associated of starting a business here,” he said. Both floors will occupy shared offices, and the retail storefronts along Hopkins Avenue will be related to the workspace, such as a coffee shop or other food and beverage operations.